This entry was posted in architecture, Art, Photography, sculpture and tagged architecture, Art, black & white, photography, sculpture. Bookmark the permalink. Can one walk in those gardens? To be honest, no, these examples don’t work for me. The thing is, you’ve seen this and you know what they look like and you probably see this when you look at this photographs. I do like them in a way, but I wish I could see more. The objects became sometimes a cacophony of lights and shades and I try to squeeze my eyes and focus to see what actually is there in the photo but my eyes get tired to quickly to go on looking. 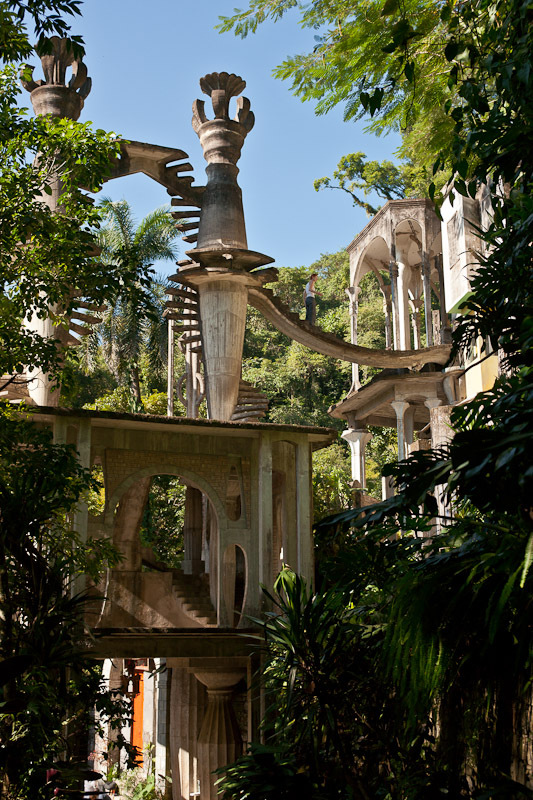 Alexandra – yes, Las Pozas is open to the public. Wow, you have a strong reaction. 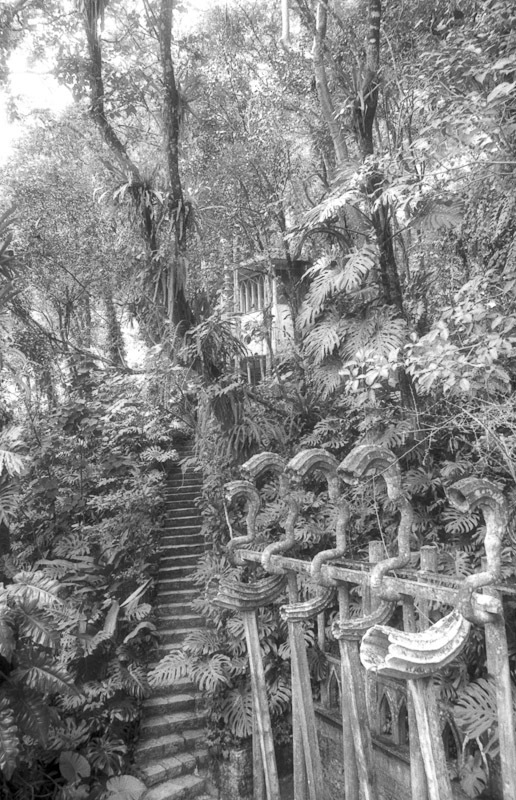 In fact a “cacophony of lights and shades” is a good description of walking in many sub-tropical jungle settings. Perhaps my photos are too impressionistic to be surreal?! Oh yes, they are impressionistic! 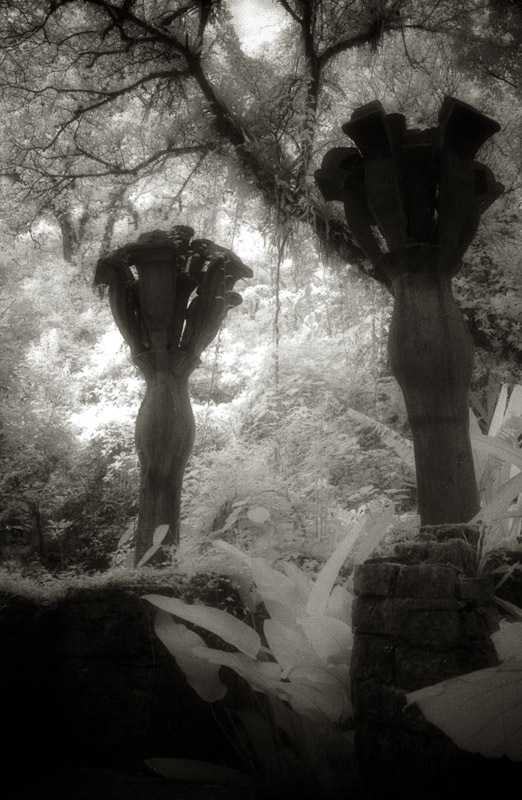 I wonder if black and white impressionism existed before. I got very interested in the idea of the gardens. Do you often walk there? I’m not an artist, well I mean I wasn’t officially educated in art, but surreal to me sounds like something that has unbelievable angles and and not possible perspectives. Oh, I’m sure these gardens are a very interesting place for photography. Do you have any wide-angles photos of those places? I have been thinking about buying a EOS 1V body to use the Aura film. What sort of exposures have you been getting with Opaque and Red Filters in good light? I guess it’s rated at 20 ISO with a Red Filter? As the film doesn’t have an anti-halation layer have you managed to get a glow effect where bright meets dark on the negative? Andy – I bought a cheap film body on eBay (£6 for a Minolta Dynax 5. A bargain, and meant that I could use the same lenses as my digital equipment). Although this and many other film cameras use an IR sensor to wind on the film, it doesn’t affect any IR film I’ve used. I rate Aura at ISO50. This gives good exposures without a filter. If you use a red filter you can still rate at ISO50 and take a reading through the filter. 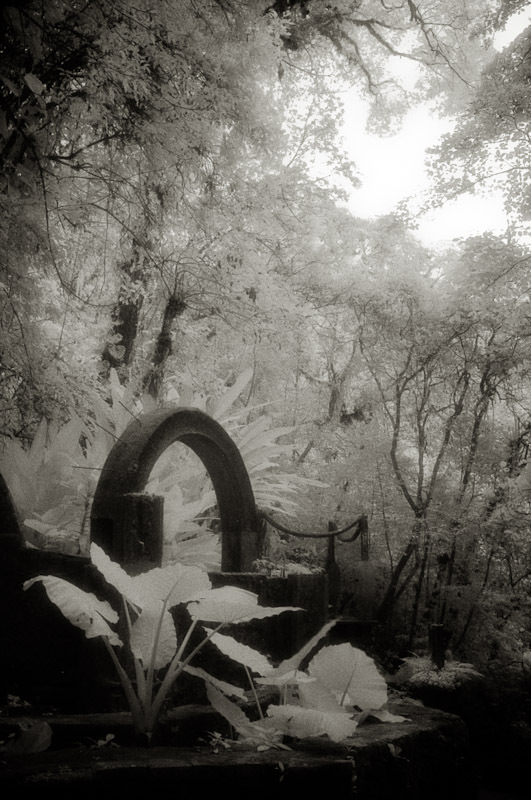 I don’t find the infrared effect very strong with a red filter so I use an IR filter that only transmits IR light. I use a 720um filter. 750um also works but anything stronger will block all the IR light that the film is sensitive to (820um is black as far as the film is concerned). With an IR filter attached you cannot see to compose through the SLR viewfinder so you need to use a tripod: compose and focus without filter (I normally take a regular b&w frame at this stage) then attach the filter, move the focus to the IR mark if you lens has one (or jog the focus ring towards infinity and stop down to f8 if no IR mark). Since the IR filter has cut out all the visible light I then compensate by bracketing my exposures at +3, +4 and +5 stops. In bright sunlight I’m using shutter speeds around 1/8th second – another reason for a tripod! Aura, without the anti-halation layer, spreads the light a lot. It’s particularly noticeable where sky meets building for example, but the effect is still present and more subtle wherever there’s a contrasting edge. It produces an ethereal effect that I really like, but then I also like grungy Hipstamatic images! 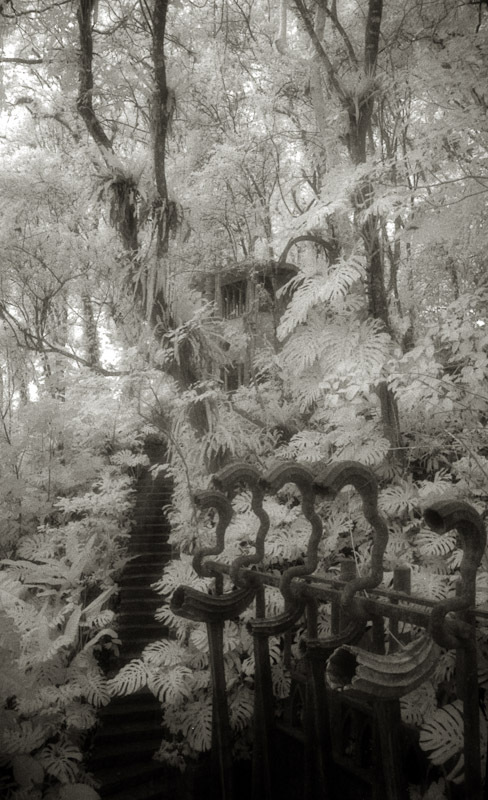 If you want crisp clean edges you are better off with Rollei IR, which I only occasionally use (and rate at ISO200). I develop for moderate contrast only. I’d rather catch all the tones in the negative then scan and manipulate for grain and contrast in the computer. 8 minutes in Kodak HC110 at 1+39 dilution, 20C and intermittent agitation is a good starting point. I only use HC110 because I have it in stock – other devs should work fine too. I hope this helps. Let me know if you post any results on the Web! Thanks for the technical bump – the speed and exposure were what I expected you to say for a red filter. If you look at my last post you will see my plans have changed a bit, however I do plan to do some darkroom Lith Prints. I was only there for a day but it made a great impression. I envy you spending time in residence! I really liked the place but others don’t “get it” – they expect a more conventional garden I suppose. What work did you do and how did the festival work out? Thanks for the heads-up on this. There seems to be two versions: a free one which contains adverts, so presumably the pay-for version is ad-free. I’ve installed the app and taken a mini-tour. It’s a great reminder/introduction to the garden. I was particularly pleased to see some archival footage/stills included. I couldn’t find the plan of the garden mentioned on the info page but not knowing quite where you are is part of the fun! IPad version has map and other treats. iPhone version is fun, but more streamlined.